Michael B. Jordan is reportedly back as Killmonger in Black Panther 2 - but how exactly? Black Panther 2 is essentially a given at this point. A billion-dollar debut and a Best Picture Oscar nomination will probably do that for you. Even so, how do you go about topping the original Black Panther? By re-introducing one of the best villains, that’s how. A bit of a slip-up over the weekend may have confirmed that Michael B. Jordan is back as Killmonger in Black Panther 2. Slay, king. Slay. Speaking at the SAG awards (via ET Online), Angela Bassett, who plays the mother of both T’Challa and Shuri, was asked whether the Black Panther cast would be returning for a sequel. “I assume so,” was her diplomatic reply, perhaps wary of Marvel Studios being liable to swoop down at any moment. Now that would have been an interesting cab ride home between the pair. Bassett, for her part, though, leans into the Killmonger Black Panther 2 speculation by stating that we didn’t see him go into the ocean and die. 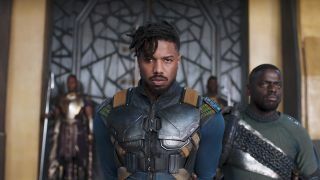 So, how would Killmonger, who was seemingly killed by T’Challa at the end of Black Panther, turn up in a potential sequel? Of course, there’s the ol’ comic book-style switcheroo where he can just not be dead. T’Challa, after all, survived a pretty big drop himself. But that’s boring. Especially now we know that T’Challa has access to Wakanda’s ancestral plain, where various dead members of his society can give him advice, or maybe heed a warning. How cool would it be to see Killmonger goading T’Challa from the afterlife or, perhaps, offering him a helping hand in his time of need? Loki has thrived in that role – and now Michael B. Jordan would be a good a person as any to keep around in Black Panther 2. Here we were thinking that the Black Panther ending was pretty clear-cut. Maybe this news changes everything?